Title text: Mouse over words and things to see where they come from. This explanation may be incomplete or incorrect: While a good start with the explanation of Baidu, the article should give an explanation of the comic in its current state. The different versions during the competition should be it's own section. Also, update image to include text. This was the fourth April fools' comic released by Randall. The previous fools comic was 1037: Umwelt from Sunday April 1st 2012. The next was 1350: Lorenz released on Tuesday April 1st 2014. This comic isn't a static image - even the title text changes depending on which part of the image you're hovering over. It presented a competition for students to see who could come closest to break a Skein hash but also an aid appeal for the Wikimedia Foundation. There are quite a few references in the comic to Baidu. Baidu is a large Chinese Internet services company that employs thousands, whose shares are publicly traded on world stock exchanges. It's the predominant Internet search provider of China, and is sometimes called the "Google of China". It offers parallels for the Chinese market of many of the services that Google provides and offers its own encyclopedic wiki with a restricted edit policy to serve as a replacement for Wikipedia. Wikipedia reports that Baidu's search engine handled 56% of Chinese internet search queries in Q4 2010. and that in October 2012, Baidu ranked 5th overall in the Alexa Internet rankings. Given that explanation for the Baidu references in #1193 is still solicited for explainxkcd, Baidu apparently is not well known yet among savvy XKCD readers. Baidu Search results reputedly follow the censorship dictates of the Chinese authorities, causing it to return censored responses to searches for politically sensitive terms like "Tianamen Square massacre" or "Falun Gong" when executed by web browsers that are connected via Chinese ISPs. When you execute such searches via Baidu in the US, the top links returned for these topics do seem to reflect Chinese government sensibilities although the uncensored English language Wikipedia articles for these topics are listed high in the query results. Baidu's reputation for censorship provides background for Megan's reply "but nothing about Tianamen Square" in response to the "Come and find your future at Baidu" employment enticement of panel one and also provides the background to understand the "It takes great minds to stifle other great minds" slogan of the second panel. The blank regions in the above image are dynamically generated from various sources. The university that is being recruited changes depending on which university is winning the hash finding competition in the fifth panel. The company doing the recruiting is randomly selected from a pool of companies. It was formerly the first NASDAQ-100 company mentioned on a varying Wikipedia page. The text in the second panel may vary: See this section. The text in the third panel may vary: See this section. The text in the fourth panel may vary: See this section. The text in the fifth panel changes, depending on which university is currently in third place in a hash finding competition. Clicking on the panel takes you to a webpage where people can enter their school's domain name and hash data, and ranks schools on how close their students can come to matching a Skein 1024 1024 hash value. The text in the top half of the sixth panel may vary. See this section. The second half of the panel is always the same. The last panel varies with the amount donated to the Wikimedia Foundation via this link. For past images, see this section. On this page, users were invited to enter "Your school's domain name" — presumably intended to be their college alma mater. (At least in the beginning, only a few top-level domains were accepted.) If the user entered an acceptable domain (by xkcd's rules, which apparently changed during the 48 hours of the competition), he could then enter data values one at a time. For each data value entered, xkcd returned a hash value and the number of bits by which it differed from the target value. The object was to achieve the lowest possible number of differing bits, ideally zero. A ranking page showed the lowest value achieved for each domain name entered, but not the data that achieved it. The first name on the list was substituted in various panels, and the third-place school showed in panel five. No data values were reported by xkcd, but various results were posted by users of the xkcd forums and on other websites, leading to copycat submissions, so that occasionally large numbers of institutions would show the same moderately low value. After the end of the contest, the data submission page vanished, replaced by the final list of rankings, which shows that Carnegie Mellon University achieved the best score with 384 bits incorrect out of 1024. The rankings only show a few hundred out of the several thousand domains submitted—presumably Randall chose to chop the copycat submissions off the end of the list, retaining only honestly obtained results. In some cases, Megan's reply seems to correspond to the company. Have you applied to [company] yet? Megan: The recruiter hasn't emailed me back in over three minutes. Megan: The recruiter hasn't emailed me back in over an hour! Have you thought of a career at [company]? Megan: I'm not that good at math. Megan: What do they even do? Megan: I don't like monopolies. Megan: Only in my darkest moments. Be part of the Apple experience! Megan: I'm not really a fan of turtlenecks. Megan: I only came to this tech talk for the xbox giveaway. Y U No Work Yahoo? Megan: I like working from home! Become a partner at Starbucks! Megan: But green's not my colour. Come work in the Amazon! Megan: I don't have to actually move to South America, do I? Megan: Not after that presentation. Thought about working for Intel? Megan: I'm not that great at division. Dude, you should work at Dell! Megan: That catchphrase is so old. Have you looked for a job at Kraft Foods? How about working for Whole Foods? Megan: Could I afford the food if I did? Megan: Maybe if they made a good bid. Hey, [university] students! | Ahoy. Carnegie Melonites! Come find your future at Baidu! Megan: But nothing about Tiananmen Square. When the Singularity happens, it will happen here. Ponytail: [Company] has outgrown us. Think of ways to make things smaller and smaller! Ponytail: I'm worried mine is too big. Ponytail: But will it blend? You'll be part of a dynamic research team envisioning the future. Ponytail: It probably looks cool. You'll be creating the future of commerce platforms! We can't tell you what you'll be working on. Ponytail: Wait. You hired a college grad as the CFO? At Qualcomm, we know you're born mobile. Short or tall, we've got a grande job for you! Ponytail: How many job openings are there? Help us find and provide the best healthy, local, and sustainable products. Ponytail: Hey guys, how about kale cookies? We're the Classmates.com to Facebook's Craigslist. Ponytail: Maybe we should use game theory. Whatever. Come create the future of gaming! Ponytail: Call of Duty 14. It takes great minds to stifle other great minds. Only a short commuter flight away! Travel to us by Roomba, we're *that* close! We're so close you can get to us by Roomba. Free Roomba rides every morning while you have coffee. Just a short Roomba ride up the coast, try not to fall off. Our recruiting team is on the lookup for promising young [university] graduates. We hired a new recruiting startup to help us hire [university] students. We borrowed the botanical gardens' net to catch promising recruits. We prefer to recruit from [university] students, of course. Our recruiters are on the hunt for unaware [university] graduates. Possibly [university] grads, if their form-filling startup works out. Or [university] graduates, provided any of them manage to fill out the application correctly. Or [university] graduates, if they manage to fill out the application correctly. MIT Oliver Smoot pgp encrypted have you ever really looked at the fourier As an undergrad at MIT in 1948, Smoot was used to measure the Harvard Bridge during a fraternity prank. This led to the introduction of "smoot" as a non-standard unit of length. SEGMENTATION FAULT save trees Contra dancing. Stanford Yes Please @twitter Are you Stanford? Ohio State Oh! IO O HAI O A joke on the pronunciation of Ohio. FOLLOWBACK TOTALLY.EDU.US CONVENIENT US DOMAIN REDIRECTS .edu is a website suffix mostly used for (American) university websites. Stanford Yes Please ford.com Are you Stanford? christopher POBox 12532 p.s. ill find my frog PO Box 12532 is located at Pyramid Lake in Nevada. Google My G+ handle? Any I'm feeling lucky G+ stands for Google+, Googles social network. I'm feeling lucky is the second option under the searchbar on Google. MY JOB NOW @ SAVE DOCUMENT AND SEND Could be Randall saying most jobs are just sending e-mails (@). Explore the depths of expensive and undocumented tools! At Apple, we believe in pushing the boundary of perfection. Yahoo management aren't just suits. We code too! At [company], you'll have the opportunity to work on cutting-edge projects. At Amazon, you'll be shaving the most cutting-edge of yaks. You get to bid first on any auction, and use other experimental tools! Make use of our powerful in-house game creation tools. Most of the comic, during the competition. Mouse over words and things to see where they come from. The part of the first panel (text and drawing) which is not a link. There is no title text at all over the part where the link is active Happy April 1st, Everyone! Last three panels (only within a frame that would just fit around all three of them). The dog gains a pound for every $10 donated to the wikimedia foundation via this link. Currently at [amount donated] (Amount = $51135.33 after competition). Come find your future at Baidu. or uic graduates, provied any of them manage to fill out the application correctly. At Baidu, Inc., you'll have the opportunity to work on cutting-edge projects. Cueball: What does "make dog" do? Any chance we can convince Randall to let other universities in: the Canadian ones only work if they have a .edu, so uwaterloo.ca and sfu.ca are out. 199.48.226.89 10:18, 1 April 2013 (UTC) I put in "caltech.edu" and hashed a lot of words, and "Twilight Sparkle is best pony." was the best result I managed, only off by 496 bits. My test here shows that the 420s is that 420 Bits wrong is about what a single computer can get to within a few hours. So its no wonder that 420s are common for a lot of universities. Its just someone there who is running a little script to break the hash. It's April 1st. Maybe the idea that the company is sourced from a Wikipedia page is not true. That would explain the link to the Wikipedia fund raising page as an apology for the fact that there will be many XKCD readers vandalising the Sith page Jeremyp (talk) 11:38, 1 April 2013 (UTC). 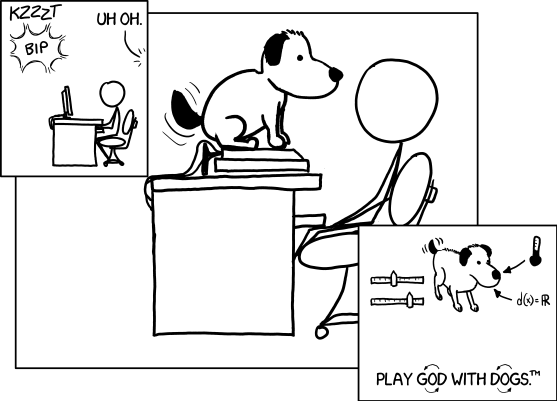 Click that panel: http://almamater.xkcd.com/ Jeremy1026 (talk) 12:05, 1 April 2013 (UTC). Baidu is a large Chinese Internet services company that employs thousands, whose shares are publicly traded on world stock exchanges. It's the predominant Internet search provider of China, and is sometimes called the "Google of China". It offers parallels for the Chinese market of many of the services that Google provides and offers its own encyclopedic wiki with a restricted edit policy to serve as a replacement for Wikipedia. Wikipedia reports that Baidu's search engine handled 56% of Chinese internet search queries in Q4 2010. and that in October 2012, Baidu ranked 5th overall in the Alexa Internet rankings. Given that explanation for the Baidu references in #1193 is still solicited for explainxkcd, Baidu apparently is not well known yet among savvy XKCD readers. Baidu Search results reputedly follow the censorship dictates of the Chinese authorities, causing it to return censored responses to searches for politically sensitive terms like "Tianamen Square massacre" or "Falun Gong" when executed by web browsers that are connected via Chinese ISPs. When you execute such searches via Baidu in the US, the top links returned for these topics do seem to reflect Chinese government sensibilities although the uncensored English language Wikipedia articles for these topics are listed high in the query results. Baidu's reputation for censorship provides background for Megan's reply "but nothing about Tianamen Square" in response to the "Come and find your future at Baidu" employment enticement of panel one and also provides the background to understand the "It takes great minds to stifle other great minds" slogan of the second panel.